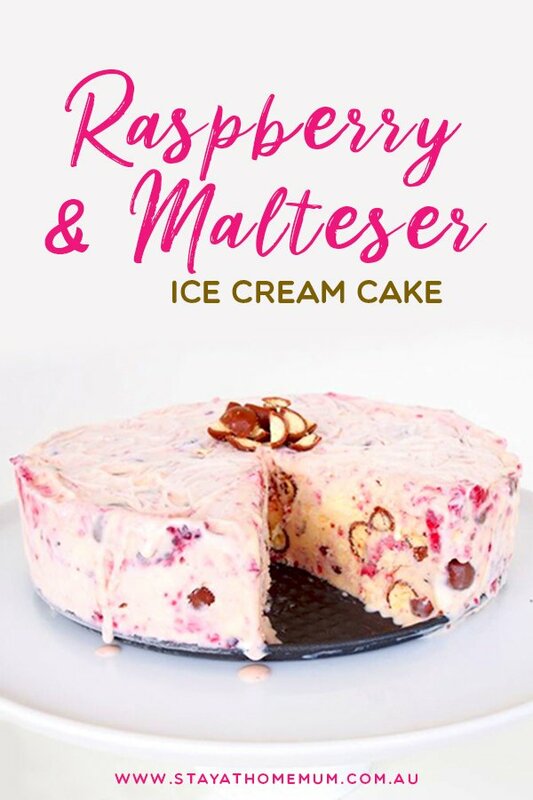 Raspberry and Malteser Ice Cream Cake is such a yummy dessert! So cheap & so easy to make! I normally make it the day before so it has time to freeze properly. You can adjust the amount of Maltesers & raspberries to your taste. Don’t put too many raspberries in it though – because the flavour can be quite overpowering and it will turn you off so slow down! Soften ice cream - either leave it out of the freezer for a little while or microwave for 30 seconds at a time. Line a round cake tin with cling wrap & cover the bottom with Maltesers. Roughly crush the remaining Maltesers, stir through the ice cream along with the raspberries. Pour into your cake tin and cover the top with plastic wrap (touching the ice cream) to prevent any freezer burn. Place in freezer for 2 hours to set again. Cut into slices & serve with a few scattered raspberries! The Raspberry and Malteser Ice Cream Cake can be frozen for up to two months.